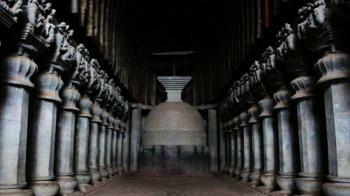 The Bhaja Caves share architectural design with the Karla Caves. The most impressive monument is the large shrine — chaityagriha — with an open, horseshoe-arched entrance; according to the Archaeological survey of India, the Chaityagrha is the most prominent aspect of the caves, and one of the earliest of the type. The chaitrya has unique reliefs from Indian mythology. Other caves have a nave and aisle, with an apse containing a solid tupa and the aisle circling round the apse, providing the circumumbulation path. Chaitygraha has some Buddha images. A cistern inscription shows the name of a donor, Maharathi Kosikiputa Vihnudata, from the 2nd century AD. A wooden beam records two more inscriptions datable to 2nd century B.C., which indicates caves have been there for at least 2200 years. Eight inscriptions are found in the caves, some giving the name of the donors. The sculptures feature elaborate headdress, garlands, and jewellery; they might have originally been painted in bright colors but later covered with plaster. Characteristic for early Buddhism, initially the caves had symbolic Buddha representation. After 4 A.D. Buddha was painted in physical form as well. Near the last cave is a waterfall which, during the monsoon season, has water that falls into a small pool at the bottom. These caves also provide important proof regarding the history of the Tabla, an Indian percussion instrument, since carvings from 200 BCE show a woman playing tabla and another performing a dance. A notable part of the monument is a group of 14 stupas five inside and nine outside an irregular excavation. The stupas are relics of resident monks, who died at Bhaja, and display an inscription with the names of three monks, Ampinika, Dhammagiri and Sanghdina. One of the stupa shows Stavirana Bhadanta means the venerable reverend inscribed on it. The stupa particulars show the name of the monks and their respective titles. The stupas have been carved very elaborately and two of them have a relic box on their upper side. Names of monks have been titled with Theras. Best season to visit the caves is between October - May. Summer temperature ranges from 22°C-40°C. Winter temperature ranges from 12°C - 33°C. By Air : Chatrapati Shivaji International airport, is the nearest airport. By Rail : Lonavala Railway station is the nearest railway station. By Road : Kamshet is well connected with other major cities through road.